Synopsis: A sound engineer’s work for an Italian horror studio becomes a terrifying case of life imitating art. My quick Review: If you are a horror movies fan or would like to know more about what’s going on behing the scenes of a movie, you should definitively watch Berberian Sound Studio. The movie is a pleasure to the ears (better to watch it with a headphone, if at home) and writer/director Peter Strickland delightfully mixes sound effects and colorful imagery to let us in the mind of his main protagonist. Berberian Sound Studio pays homage to the italian cinema (more specifically the giallo) from the 60’s to the 80’s through its use of color, close-up shots and of course sound. It reminded me at times of the works of Mario bava, Dario Argento, Brian de Palma but also Stanley Kubrick (some of the cinematography and the character’s journey). 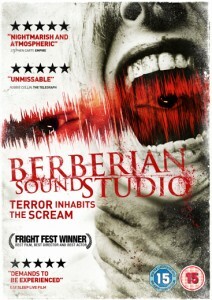 Clearly ,Berberian Sound Studio is not a movie that will satisfy everyone. There is absolutely no gore (we never see any actual footage of the movie that the studio is working on) and it’s not scary whatsoever. Furthermore, the ending is quite abrupt and nothing really happens during the run of the film. Berberian Sound Studio should therefore be appreciated as a rich sensory experience, a journey into someone’s psyche, showcasing the artful sense of direction of a promising young director. Not for everybody, but well worth a watch. Click Here to Own Berberian Sound Studio and Watch it Now!